Your home will have multiple circuit breaker types. As the name implies they break the current for circuits in your home. This would happen for one of two reasons. One the circuit gets overloaded or a short occurs. The breaker will trip before the wire gets too hot. The other would be the ability to manually shut the power off to work on the electric or a device. Not sure if this is the right place? See the article on 'Basic House Wiring' for information on all the wiring topics. Got an electrical project that you need to get done? See 'Wiring Electrical Fixtures' and 'Home Electrical Repair' for a listing of all the related articles. Single Pole Breaker - This breaker works on one side or 'pole' of your 240 volt service. Thus, it controls a 120 volt branch circuit. The amperage can range between 15 and 30 amps with 15 and 20 amps being the most common. This type of breaker will be used for outlets and lights in your home. They can also be used for individual circuits that require 120 volts, such as furnaces, washing machines and sump pumps. 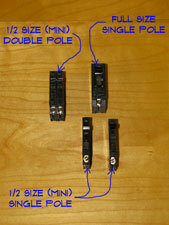 Double Pole Breaker - This circuit breaker type picks up both poles of a 240 volt service. So this type provides 240 volt power to the circuit. They are used for appliances like ranges, ovens, dryers and water heaters. Double pole breakers can go up to 100 amps or more. Higher than fifty amps is usually to feed a sub panel somewhere else in the home. GFCI Breakers - Ground Fault Circuit Interrupters are for circuits that service areas of your home where water is present. Bathrooms, kitchens, garages and outdoor receptacles all require GFCI protection. This type of circuit is not always opted for, since it can involve an lot of extra wire to pick up the individual wet location devices. GFCI protections can also be achieved by installing protected outlets at key spots. AFCI Breakers - Arc Fault Circuit Interrupters protect against arcing that can cause fires. Home built since 2008 are required to have arc fault protection for bedrooms and living spaces. These breakers generally have a gray color and a special reset switch on them. The wiring in older homes may not allow for the use of an AFCI Breaker. Half Size or Mini Breakers - Standard single pole and double pole breakers are available in a half size model by many manufacturers. Standard single pole breakers are 1" thick and a 'Mini' will be 1/2". this a great feature for adding circuits to an existing panel. The panel box must be set up for the use of mini breakers. Some panels do not allow for them or only allow for a certain number. The ability to add circuits to a panel box will depend on a couple of factors. The first would be the load on the panel. Is the main breaker large enough to accommodate another circuit. The second would be available spaces. For a panel that is filled you may be able to purchase half size or mini breakers. You can put two of these in place of one full size breaker. See the article 'Adding a New Circuit Breaker', for more information. Breakers are usually specific to the panel manufacturer. Some are interchangeable but it best to check and make sure the breakers are compatible with the panel you have. Take one with you to be sure. Yes, circuit breakers can go bad. They usually fail on the side of tripping when there is no overload. When they go bad, the only option is to replace the breaker. Another reason to replace a breaker would be to change the type, although this would be uncommon. You could add a GFCI breaker to your panel if wanted to cover a group of plugs with this protection, maybe in your garage as an example. The two key concerns for replacing a breaker are: First, getting the right one and Second shutting the power to the panel off before you attempt to change the breaker. For a complete discussion on replacing a breaker, see the article 'How To Replace a Circuit Breaker'. This information will provide step by step information changing out the breaker.